This BrieflySpeaking does not focus on the debates about rankings or the associated challenges. Rather, it explores the four ranking systems mentioned above and unpacks what we can learn about South African institutions from them. BrieflySpeaking (6) The National Plan for Higher Education (2001) targets: Have they been met? 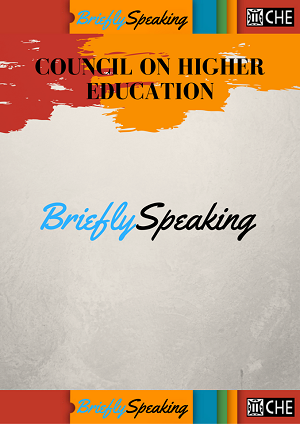 Given that a draft National Plan for the PSET sector for the next decade is currently in consultation phase, in this issue of BrieflySpeaking we reflect on the targets that were set in the National Plan for Higher Education of 2001. Using data from VitalStats 2016, which was published in March 2018, we consider the extent to which these targets have been reached and point to some interesting developing trends. BrieflySpeaking (5) Private higher education landscape - With the entrance of many new players in the South Africa private higher education market, both local and international, the landscape in terms of size and shape is changing rapidly. This monitoring brief provides an overview of five current trends and suggests potential future developments in private higher education. BrieflySpeaking (4), History Departments - This monitoring brief provides an overview of History Departments across South Africa at a particular point in time. The brief does not attempt to interrogate the information provided in any depth, nor to assess the extent to which departments at specific institutions have transformed or decolonised their curricula. It is purely a summary of the public information provided by these departments, compiled as a starting point for further analysis of curriculum transformation.